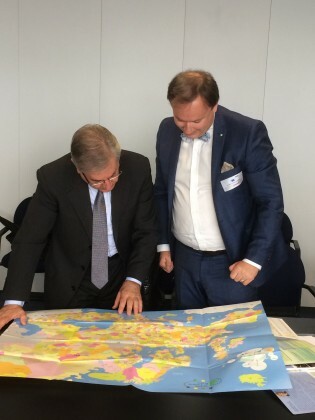 “It is useless to come with directives, regulations and strategies if they are not implemented“: Karmenu Vella, Commissioner for Environment, Maritime Affairs and Fisheries, opened the meeting with the delegation led by AER Vice-President Magnus Berntsson on 20 May 2016 in a frank and honest way, stressing the importance for the European Commission to cooperate with the regions for an efficient implementation of the environmental policies. Magnus Berntsson took the opportunity of this meeting to introduce the keynote discussion on the topic of the Arctic that AER will hold in the framework of its 2016 General Assembly on 23 June in Nordland (NO). M. Vella presented the European Commission’s communication on “an integrated European Union policy for the Arctic” and expressed the crucial need to find global solutions and to take global actions in this area. The Arctic region indeed “represents a huge potential in terms of economic opportunities, which can only be sustainable by taking our environmental responsibilities” added the Commissioner. This potential was also raised by M. Berntsson, highlighting a.o. the blue growth and the green tourism. Blue growth was at the heart of the discussions with a number of concrete examples given by the members of the AER delegation. Following the presentation made by the Commissioner on blue growth economy and the potentiality for outermost region (OR), Cyrielle Cuirassier, representing the outermost region of Guadeloupe (FR), took the opportunity to ask for the state of the art (technical level) regarding the task force to be launched. In line with the presentation made by the Commissioner, she reminded him about the specificities of the archipelago of Guadeloupe (art.349), and brought specific data such as the youth unemployment rate (Eurostat), and the added value of Guadeloupe as an OR in accordance with the communication of the EU commission (2012). Commissioner Vella promised to strengthen the dialogue on these topics with Commissioner Cretu, in charge of the outermost regions. 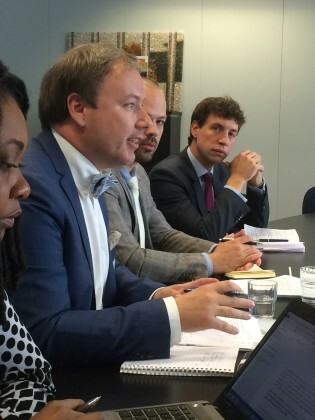 Magnus Berntsson emphasized the need for common standards in the education system related to maritime professions, also to attract young people. On top of the need to safeguard the oceans with sustainable fisheries and aquaculture, the Commission emphasized on the potential of energy (including innovative forms such as wave energy) that represent the oceans, and the question of global governance it raises to face these new challenges. Making the link between maritime affairs and environment, all the parties around the table agreed on the urgent need to take actions regarding the use of plastics and its consequences on the oceans and shores. Again, the Commissioner called for a global response as “marine litter is a global problem: all possible waste end up in the oceans that we share globally” he said. 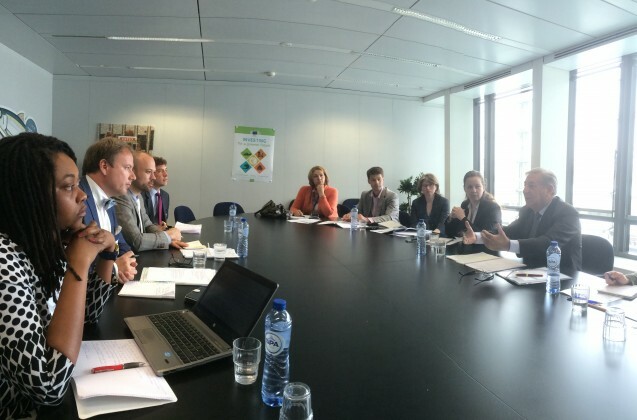 The topic of circular economy, especially green public procurement, was also discussed by the delegation. Giving an example of best practice from his home region of Västra Götaland (SE), M. Berntsson asked for a clearer definition and proved that “green public procurements and tenders can be used as incentives and to create new markets”. 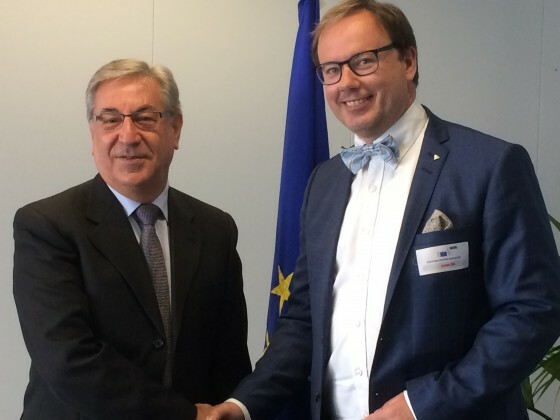 Commissioner Vella praised the work of AER in the field of circular economy, and more specifically the ongoing Regional Innovation Award which will be presented in December 2016 in Brussels. To close the meeting, Mitar Vasiljevic exposed to the Commissioner the main elements addressed by the region of Vojvodina (RS) regarding environmental policies, and called the Commission for a greater support from the main funding programmes of the EU to the candidate countries, such as LIFE+. Quoting the work done during the COP21, AER and the team of Commissioner Vella will keep on working together in the next months and years to achieve their common goals: a better implementation of the environmental policies in Europe and globally.